I’ve been craving doughnuts lately. Not the glazed kind, I’m not the biggest fan of those, but rather ones covered in cinnamon sugar. Those are my favorite. 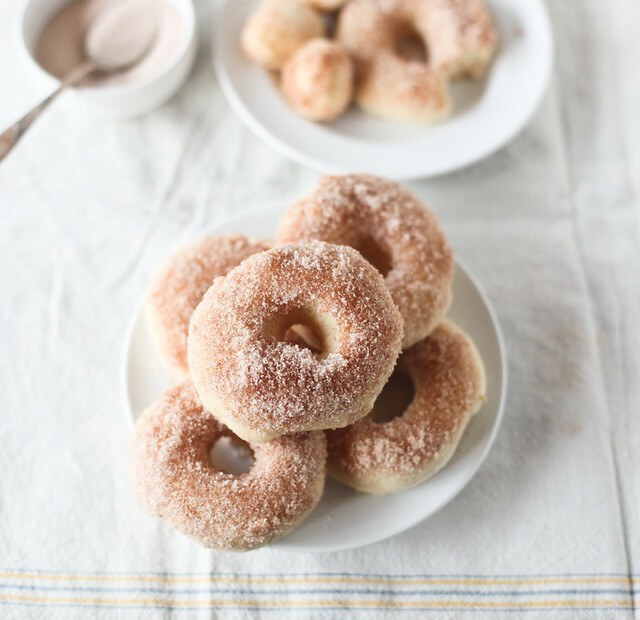 This recipe is from Lara Ferroni’s cookbook, Doughnuts. I absolutely love it. 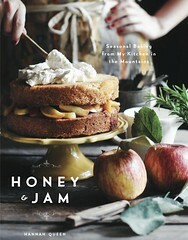 It’s beautiful, filled with Lara’s gorgeous photography, and every single recipe sounds like heaven. It’s well written, easy to understand, I love when recipe writers tell you things like “dough will be soft and moist, but not overly sticky”. That is so helpful when you’re making something new. I can’t say enough good things about it about this cookbook. This is her baked doughnut recipe. While I wanted doughnuts, I didn’t want to fry anything. It’s messy and I just wasn’t feeling it. I’d never had baked doughnuts before, so I decided to give it a try. These are beyond delicious. Soft and fluffy, and I bet if you glazed them, you wouldn’t even know they were baked instead of fried. Also, this is the easiest doughnut recipe I have ever used. It came together in no time. a note: I don’t have a doughnut cutter or even a cookie cutter (i know, what is wrong with me?) so I used a mason jar lid and a shot glass to cut out my doughnut shapes. It worked perfectly! In the bowl of a stand mixer fitted with the paddle attachment, beat the egg and sugar on medium speed until blended, about 1 minute. Add the milk, yeast, salt and vanilla, and stir to blend. With the machine on low speed, add 2 cups of flour, about 1/2 cup at a time, and beat until the dough is thick and pulls away from the sides of the bowl. Switch to the dough hook. With the machine on medium speed, add the butter one piece at a time, and beat until no large chunks of butter are left in the bottom of the bowl, 3-5 minutes. Reduce speed to low and add the additional flour until the dough gathers around the hook and cleans the sides of the bowl. It will be soft and moist, but not overly sticky. Turn the dough out onto a floured surface and knead gently until the dough no longer sticks to your hands. Lightly grease a large mixing bowl. Transfer the dough to the bowl and turn to coat. Cover with a damp tea towel and let rise in a warm spot until doubled in volume, about 1 hour. Punch down the dough and roll out to 1/2 inch thick. With a doughnut or a cookie cutter, cut out 3 inch diameter rounds with 1 inch diameter holes. Preheat the oven to 400 and line a baking sheet with parchment paper. Place the doughnuts at least 1 inch apart on the baking sheet. Cover with plastic wrap and let sit in a warm spot until nearly doubled in size, about 20 minutes. Bake until the doughnuts are light golden brown, 5 to 8 minutes, being very careful not to overbake them. Immediately out of the oven, dip into butter, then directly into cinnamon sugar mixture. Best eaten fresh and warm. These are so beautiful and just sound fabulous! OMG...these look amaaaaazing. My husband keeps telling me he makes "the best doughnuts" but in over 5 years together I've yet to eat them. I think I'm going to trump his claims with these! Thanks for sharing this! The photos are so delicious. Can't wait to try the doughnuts! This sounds amazing. I've never tried to make doughnuts before because they need the frying and I'm not brave enough for that yet... So I'm definitely trying this out. Thank you. And very beautiful photos. Gorgeous. Warm dough with cinnamon and sugar on top is one of my favorite treats. wow, this looks beautiful, and, i'm sure, tastes beautiful. simple is best, and i can't wait to try this. You won me over with just the post title...my apartment is so small and the few times I've fried something the smell lingers for days. And I prefer cinnamon sugar to glazed doughnuts! It's like you knew what I wanted! so, so lovely! i love cinnamon sugar...plus it's sparkly! i totally agree w/ you about recipe details, especially with things so varied as dough. These look scrumptious, Hannah! You can tell how fluffy and light they are by how well risen they look. 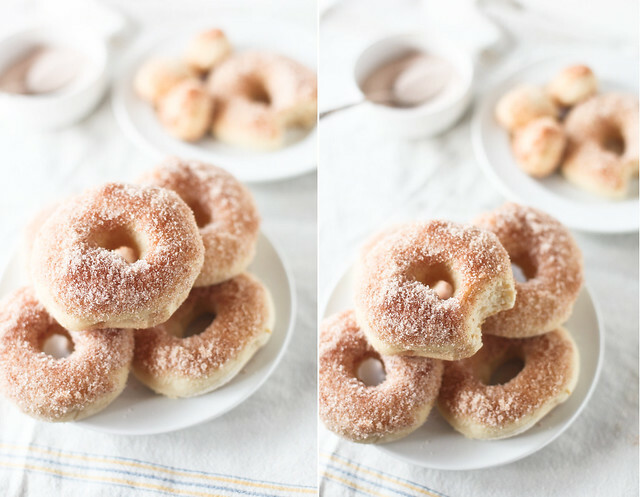 Cinnamon sugar donuts are my particular favorite as well. Beautiful pictures as always! I knew I shouldn't have clicked over...you are dangerous. These doughnuts look amazing. This book is awesome, I so agree with you. Yet I have a crsving too for doughtnuts! I could eat five of these right now. They look heavenly! Oh, Hannah. Such torture to gaze upon my screen! I must refrain from licking it!! These look AMAZING! My boyfriend has been begging me to make doughnuts, but I cannot stand the mess that comes along with frying. Cannot wait to try these. I like that they aren't fried. They look so good! Beautiful! I only like these kind of doughnuts too! I think I'll make some this weekend! hannah, you are my girl. thank you a thousand times!! Absolutely beautiful! And it's just adorable how you improvised making doughnut shapes with a mason jar and a shot glass. ha! Beautiful! Such lovely pictures. I'm ramping up to make some jam doughnuts but the have to be fried...it's the only way for these particular ones and I'd get disowned by my husband otherwise. Love the look of these though! Those are the prettiest doughnuts I've ever seen! They sound like an oxymoron, but I'm so excited that they're baked and still delicious. The last time I deep-fried anything it got super messy. Thanks for sharing! these are so pretty! I don't have a doughnut pan either and I was just despairing today about it...but I DO have a mason jar and MANY shot glasses! Thanks for the tip! Wow, those look amazing! Better than Krispy Kreme any day of the week. That's all I can say. Incredible! These look, sound and I can only imagine how tasty they are. Beautiful photos!!! not only does the recipe look pretty easy, they look so delicious too!! They look so fluffy and delicious! I love your photos. Everything looks so light and airy. Beautiful. I'm so making these!! Love the fact that their baked too. Much healthier then frying. Gorgeous, gorgeous post dear!! xo. OMG they look & sound amazing & no frying....so trying this recipe out. it's been a long time since i've had a doughnut! these look delicious. Hannah, you're a goddess. These look incredible. @Laurana - maybe you should skip doughnuts and eat a friendly pill instead. NOT FRIED?!! That's NOT fried?! Looks amazing. I am so writing this down in my recipe book! Lovely imagery. 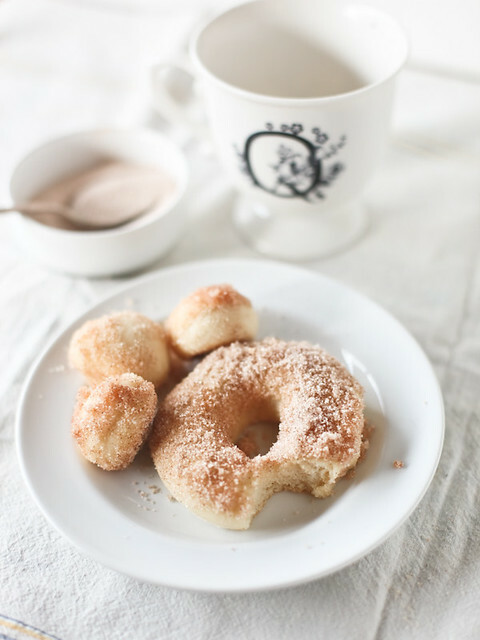 We baked a batch of cinnamon sugar doughnuts very, VERY similar to this last year. Just perfect. this looks like a recipe i need to try. i bet their great with a cup of tea! These look so lovely! I've always wanted to make my own doughnuts! Now I've got a recipe (: Thanks. Can you just put one in an envelope and send it out here to my office???? I've only started reading your blog recently, but since I have, every post that you've put up has gone directly into my favorites, waiting to be made!! Absolutely breathtaking photos, as is usual, I am beginning to find, and a wonderful, wonderful, recipe that I'm just itching to make! gosh those sure do look delicious!!! I have this cookbook at home, and I hadn't tried this recipe yet. After seeing your lovely photos of the doughnuts, I have to give them a try! Though, I'm sure mine won't look nearly as beautiful as yours! My God.... I think I want to marry you. 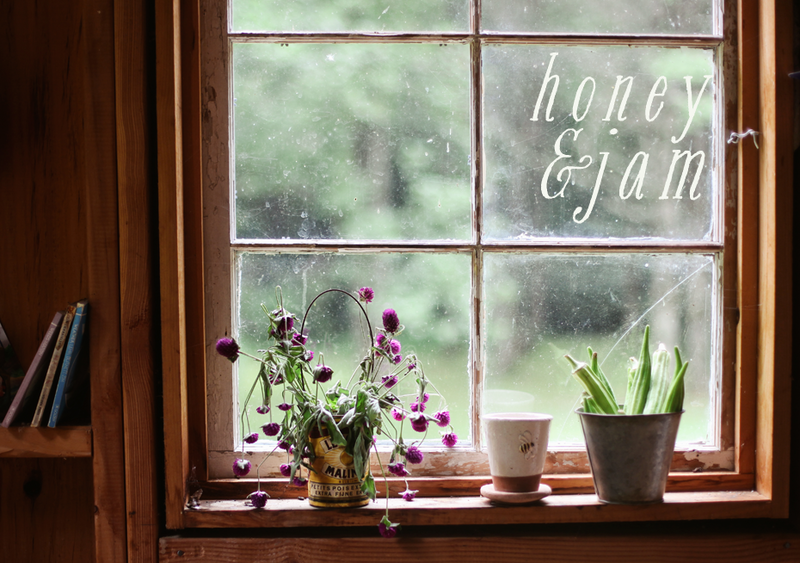 found this blog through Elephantine... OMG i think i'm in love.. your recipes and photographs are beautiful! Oh Hannah! These look fabulous! I am drooling and wanting some for lunch. Now, please. I don't mean this as offensive in any way. But struggling with this myself and finding victory in Christ, I wanted to share this with you. What fantastic timing! My husband just bought me a cute little mini doughnut pan, so thi sis perfect! I love cinnamon sugar doughnuts. Yum! I made these today! They weren't nearly as beautiful, but they were delicious. Thank you! Such gorgeous photos! I only occasionally get a craving for doughnuts but these would definitely make the cut when I do. As do these: http://orangette.blogspot.com/2006/06/to-brandon-with-nutmeg.html Have you tried them? They aren't fully in the doughnut category, but just as satisfying. we made your doughnuts and they were so good! You know... I can normally pass on a doughnut. There are so many things I'd rather eat than a dry, fried ball of dough. But these... THESE... look divine. Now you have me drooling. Oh, Hannah. These are absolutely beautiful. The lighting in this is exquisite. oh my they look so delicious! What?!? Those look so wonderful! I've been wanting to try my hand at doughnuts but was hesitant about all of the oil (healthwise, sure, but it is also such a pain to clean up!). This seems like the perfect recipe to start with. I've been looking for a baked doughnut recipe, and ma'm I'm going to have to try this recipe. These doughnuts look delicious! Oh you are making me drool! This is now on my to bake list! I have never tried making baked doughnuts. I recently got a mini doughnut cutter and I think I'm going to fry some up tonight. You have beautiful pictures in your blog! These look incredible - more wonderful photos as usual - will have to set aside some time to make these. hi! i just made these for a brunch i had to attend this weekend, they came out great :) you can see them here aaezimmerman.blogspot.com thanks so much!! I'm sharing this with my youngest daughter & my mother. These look & sound delicious! I just discovered your blog & I love it! WOW, I'm so glad I found your amazing blog with all the lovely photos. made them last night..AMAZING!! they were delicious! thanks for sharing! Your lighting is beautiful. My Seattle-induced muted eyesight had to readjust to such a pleasant surprise! Hi Hannah, this is my first time visiting your beautiful blog. I found you on Artful Blogging, which I picked up today. You are a very talented young lady, I look forward to trying your recipes and reading your future posts. Take care. These are absolutely gorgeous doughnuts!! Ohhhh, this reminds me of my grandma's recipe! Every year around Christmas she used to make these sugar and cinnamon donuts that were just heavenly! I guess it's time I learn to make it myself:) Thanks for the idea. Those sound delicious. I will have to try them. I love doughnuts but I don't want anything fried. These look gorgeous. I have been looking for a good recipe to bake doughnuts. I dislike deepfrying things. I either end up burning the food or burning myself. Thank you for the book review. Wow - these look great! I'm looking forward to making them soon. Your site is beautiful. Awesome photography. What a beautiful blog. Photographs are so lovely I can almost taste the delicious looking food. I'll be back! Made these today. They are delicious! My 10 year said "These are awesome." I rolled them a little thin, but they still turned out great. Next time, I'll try them with a chocolate ganache and other flavors. Wow these look very nice, I have been making my own breads and focaccia lately so this recipe has inspired me to try some baked doughnuts!